Gossip is a part of human nature. We are social animals and care about our statuses among family, friends, and coworkers, sometimes at the expense of others. Cécile Guéret, writer for Psychologies magazine, states that “gossip builds social bonds because shared dislikes create stronger bonds than shared positives,” which helps to explain why people find it to be so enjoyable. See the difference? Same subject – someone who is not in the room – but entirely different subject matter. When you find yourself being asked to contribute to gossip about a coworker, resist the temptation to join “those in the know.” The enjoyment felt by sharing secrets is fleeting, and depending on what is being talked about, gossip can easily cross over into harassment. Be professional but firm in your response. Tell the group that you strongly feel that the subject matter is inappropriate. Express concern that the conversation has the potential to hurt someone else and damage professional relationships. Or, be bold and offer to go find the person being talked about so they can join the conversation. You can also attempt to change the subject and discuss something positive, robbing the gossipers of their delight in bringing others down in front of an audience. It takes at least two to gossip, so by simply refusing to participate you can stop gossip in its tracks. 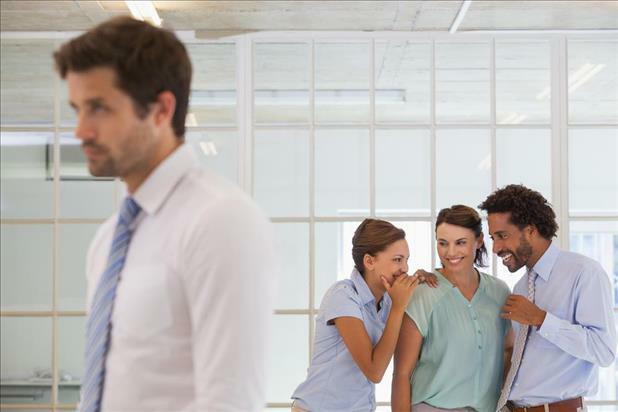 If the behavior persists and you find that workplace gossip is significantly affecting your performance, speak with HR or your supervisor about the problem before it gets out of hand.